24 Hour Emergency Tree Service - For service in a jiffy, when the weather’s been quite iffy, there’s no need to throw a tiffy, Edmond Tree will make it spiffy! Edmond Tree is your Emergency Tree Care specialist! Tree Removal - Sometimes a tree just has to go! Edmond Tree handles all tree removal in a very professional manner, taking all precautions and keeping the safety of your property, family, and our crews in top priority. ﻿Stump Removal﻿ - Are you looking for the Best Stump Removal in Edmond? Look no further, you’ve found us! We’ve got several options for removing those unsightly stumps, so give us a call today! Tree Cutting - Whether the tree needs to be cut down section by section, or it’s just a few branches that need to be cut off, Edmond Tree will surpass your expectations in professionalism and performance. Stump Grinding - One of our most requested services, we deliver the Best Stump Grinding Edmond has to offer. This is a very efficient method for removing unwanted stumps in the yard. Tree Trimming - Edmond’s Best Tree Trimming service right here! Our Edmond Tree crews are masters at identifying the problem areas in a tree and removing just enough so that your trees will continue to stay healthy for years to come! Tree Pruning / Tree Surgeon - Our certified Tree Care Specialists will take care of your trees with precision and craftsmanship! If you are looking for an Edmond Tree Surgeon, you’ve found us! Tree Cabling and Bracing - One of our specialized services, tree cabling and tree bracing are often needed to protect and enforce the structural integrity of a tree. If you have a concern that your multi-trunked tree or tree with an open canopy may be in need of these services, give us a call today! ﻿Tree Crown Thinning﻿ - A pretty common practice with broad leaved species, this service is ideal for letting more light thru, reducing wind resistance, and decreasing weight in the tree. Tree Crown Reduction - NOT to be confused with “topping” (EEEWWW....BAD), Crown Reduction is an ideal practice for reduce the structural weight of a tree while giving it a similar but smaller outline of itself. Brush Clearing / Land Clearing - Whether it’s land clearing, construction grading, fire damage, scrub brush removal, or cleaning your hedgerow up, Edmond Tree wants to be your first call for these services! Wood Chipping - Are you needing a Brush Pile Cleanup? Do you have loose wood around your property or a brush pile that has sat there for way to long? Give us a call today and we will chip it and haul it away! Firewood - Do you have a few trees around your property that need to be removed, or some dead ones that have already fallen? We will gladly cut them down in to logs that will be perfect for your fireplace! Storm Cleanup - When the wind comes howling at your door, chances are he’s left a few branches down in his path. Give Edmond Tree a call for our Storm Cleanup Crews to come out and remove the damage. Tree Felling - When a tree must come down, give Edmond Tree a call! We bring trees down in a safe manner without risking further damage to your property. Tree Planting - One of our favorite slogans is “Give a Hoot for the Root!” We take that seriously by encouraging all that are willing to plant more trees! It’s easy to cut down the tree that’s already dead, but have you thought about planting more trees around your home? Let Edmond Tree help you with selecting your favorites! Preventative Tree Care - We love to help our customers put a comprehensive tree care plan together to provide long term health care for their Foliage Friends! Give us the chance to come out to your place so that we can work with you to begin putting a plan in place for yours today! Edmond Tree strives to achieve the best rated tree care service in the Edmond and North OKC area. With our knowledge and experience, we believe that there is no problem that we cannot tackle! Give us a call today at 405-562-5725 to schedule your Free Consultation on how we can help you with your property and trees! ​Trees serve many vital purposes. They filter the air we breathe. Provide shade in the hottest parts of summer. Children the world over learn to climb and see the world through the eyes of an eagle, thanks in large part, to trees. When the weather decides to play “Wizard of Oz,” pick up the tree and land it on your house, you are going to need some help. That’s where Edmond Tree comes in. We provide 24-hour service for those unexpected curve-balls, in the form of our barky friends, life throws at your door. Or through your garage. Or your roof. Well, you get the idea. Edmond Tree also wants to help you keep your home from becoming a twister’s new friend, by providing preventative maintenance. We offer comprehensive tree care. No project is too small or too big. That’s why we have chainsaws! We respect Mother Nature. But sometimes she’s cranky. That’s why we want to help you keep her happy, by keeping your arbors healthy and alive. Removing unwanted overgrowth, dead or sagging branches and keeping pests at bay are just a few of the ways Edmond Tree can keep your trees at tip-top performance shape. Speaking of pests, sometimes they get the best of your trees. It’s like that one guest that no one invited to the party, but they showed up anyway. Then they were rude and obnoxious, and they may have taken your favorite pair of socks. Who does that? Our trained staff can help you get rid of your unwanted tree. The party guest is all you though. Trees aren’t just what you can see. Remember, they also live below the earth, where their roots pull in nutrients. Your plumbing is not a place they should be. Edmond Tree can help with that as well. We can not only remove the stump but help you get rid of those pesky root systems, so you don’t have to pay the plumber too. That means more of your money stays in your pocket. Then everyone wins. Except maybe the plumber. Sorry, Mario. Edmond Tree offers service for residential and commercial properties. Storms aren’t the only disaster we help clean up after either. Humans can be pretty messy too. We also provide support for cleaning up overgrown property and after fires as well. Speaking of fire trees provide an excellent heat supply for your woodstove. We are happy to take your unwanted tree and repurpose it into firewood for you. We want you to stay warm in winter. After all of this work, you’d think we would leave a mess behind. Untrue! Edmond Tree is committed to leaving as little impact on the environment as possible. 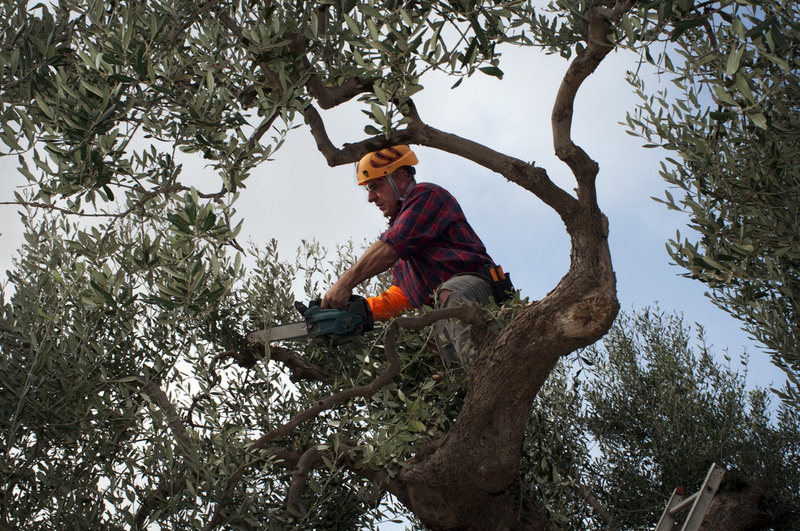 Whenever possible, we use sustainable ways of providing care and intervention for your trees. We will only use chemicals when we have to. We clean up after ourselves. Your unwanted tree parts will be sent through our chipper and made into mulch and get reused. Let us know if you want some mulch for your yard. We are happy to leave some for you and can even give you some tips and pointers on the best ways to spread it to promote wellness for your entire yard. Take pride in knowing that we will put your home and your family’s best interests at heart. Your home is an investment, and we want to invest in you, our customer and know you are satisfied. Edmond Tree is happy to offer services all over the Metroplex. We welcome your questions and your problems. In fact, give us a call or contact us via our website. Our certified arborists enjoy a challenge!